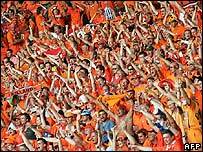 Football's governing body has explained why up to 1,000 Dutch fans watched a World Cup tie wearing no trousers. Around 1,000 fans arrived for the Ivory Coast tie in their traditional bright orange trousers - but bearing the logo and name of a Dutch brewery. To protect the rights of the official beer they were denied entry, so the male fans promptly removed the trousers and watched the game in underpants. Fifa said an attempt at an "ambush" publicity campaign was not allowed. Fifteen major companies have paid up to $50m (£27m) each for the right to be official partners at this World Cup. The American firm Anheuser Busch, which makes Budweiser, won the exclusive right to promote and sell its beverage in the stadiums and other venues. There has been a wider resentment in Germany that a US brewery has the exclusive rights in a country which prides itself on the quality of its beer and has very strict laws governing its composition.